Asif Ali struck a magnificent 151 as Liversedge inflicted a first defeat on Bradford League Championship Two leaders Hartshead Moor last Saturday. 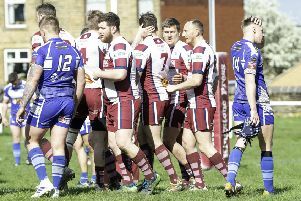 Liversedge produced a stunning display to inflict a first defeat of the season on Bradford League Championship Two leaders Hartshead Moor last Saturday. Asid Ali was Liversedge’s star man hitting an unbeaten 151, in an innings that included two sixes and 21 fours, to dominate his side’s total of 204-8. Iain Wardlaw was the most-successful bowler but his three wickets cost 81 runs. Mohammad Khan led the Hartshead reply with 98, but they were bowled out for 186 as Ali capped a magnificent display by claiming 5-47, with support coming from Steve Lane (3-39). Hunslet Nelson moved up to second place after bowling out Altofts for 89 on their way to a six-wicket win. Asim Iqbal (4-3) and Rakesh Seecharan (4-39) were in good form for Nelson. Hopton Mills slipped to a ninth defeat of the season in going down by eight wickets to Idle. Salman Khan claimed 5-23 as Mills were bowled out for just 70, with Zaaid Sajwal (35) scoring half their runs. Idle had no trouble knocking off the runs, Naseem Aslam making an unbeaten 41. Spen Victoria remain second-bottom, 13 points behind Hopton, after an 82-run defeat to Keighley. Nathan Storton (58) and Andrew Wear (41) helped Keighley post 213, with young spinner Alex Leadbeater taking 4-68 for Spen. Mark Loker top scored with 40 in reply but Spen were bowled out for 131, while Owen Narey claimed 3-31. Nick Busby (5-33) Jonathan Thurwell (4-33) impressed as Carlton bowled out Northowram Fields for 98 before opener Chris Wynd (46) helped Carlton to a seven-wicket win. Brighouse produced a surprise in defeating Buttershaw St Paul’s by 34 runs. Brighouse were bowled out for 117 with the experienced duo of Tosh Baker (5-25) and Ben Platt (3-21) posing problems. Adil Mahmood (39) and Sohail Hussain (36) top scored. St Paul’s had no answer to the impressive bowling of Asad Mahmood (7-25) as they were dismissed for 83. Only Gary Wainwright (37) challenged the grip of the bowlers.